During the course of 2010 – 2011, the Indonesian Government has restricted the number of foreign journalists who are given access to enter Papua and report on the situation there. 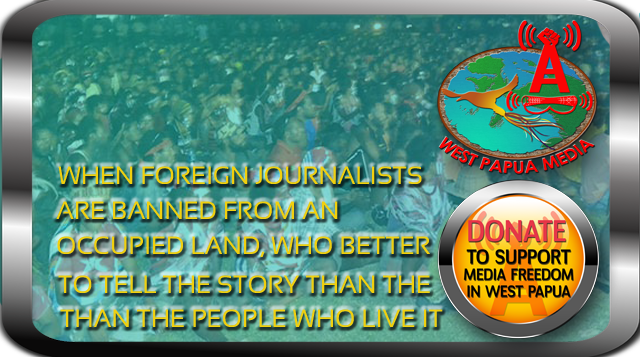 As well as journalists, a number of foreign NGOs have been prevented from functioning in West Papua. All this was said in a report issued by the Faith-Based Network on West Papua, Franciscan International, Papua Land of Peace and the Asian Human Rights Commission which was launched at the P3W Aula in Padang Bulan on 21 April. The report states that in January 2011, Peace Brigades International (PBI) closed its operations in Papua and left Indonesia. After working in the province for six years, the lack of legality for its work and visa problems were among the factors that made it impossible for the PBI to offer protection for human rights defenders who were under threat. Two years earlier, in 2008, the International Committee of the Red Cross was ordered by the Indonesian Government to close its offices in Papua and Aceh.. The report also states that even though some foreign journalists were granted permits to vist many parts of Indonesia, access to Papua was restricted. Journalists who were granted access were followed and restricted in their activities. In May, 2010, the French journalist Baudouin Koenig was arrested by the Indonesian police because he was taking photos of a peaceful demonstration in the city of Jayapura. even though he was in possession of a journalist’s visa that permitted him to write reports about all parts of Indonesia, including the provinces of Papua and West Papua. Kristina Naubauer, the co-ordinator of the Faith-Based Network on Papua, said that up to this day, the world at large knows nothing about Papua because the Indonesian Government refuses to grant access to foreign journalists, to human rights activists and to other observers from outside Indonesia. ‘Up to this day, when we people from outside Indonesia give talks about Papua, no-one knows anything about Papua. People ask us, ‘Where is Papua?’ she said during the launch of the report about human rights in Papua in 2010 – 2011.